The TB-S Series Turbo Rim Blades possess wide turbo sections designed for aggresive abrading of a wide range of materials, resulting in faster cutting speeds. In addition, the medium-hard bond make these blades suitable for most aggregates, an ideal solution for multiple applications. 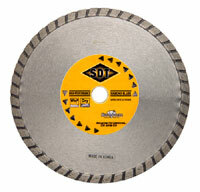 The CT-G Series Turbo Rim Blades are ideal for concrete/masonry applications due to its abrasive-resistant bonding system, which guarantees optimal performance during the blade's lifetime. 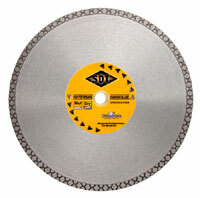 These economical blades provide fast and smooth cutting for professional results. 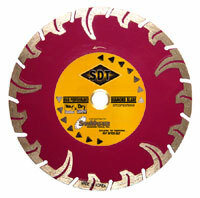 The TS Series Turbo Segmented Blades are engineered to cut hard materials such as granite and cured concrete. 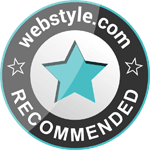 Its unique design provides undercut protection for the diamond segments to ensure lasting performance even while cutting abrasive materials. 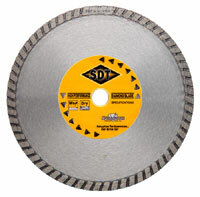 The TB-G Series Masonry Wide Turbo Rim Blades utilize a medium-hard bonding system with high grade diamonds for fast, dry cutting of natural stone and other hard materials. 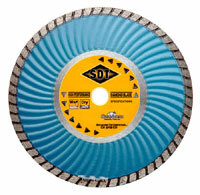 The TW Series Turbo Rim Blades are best suited for stone and masonry applications. The wave-enforced steel body serves a dual purpose of increasing rigidness of the body to promote overall blade durability, as well as enhance airflow to boost cooling efficiency to levels never achieved before by traditional flat body cores. The CT-R Series Turbo Wave Blades have a narrow turbo pattern for fast cutting of granite and various other natural stones. 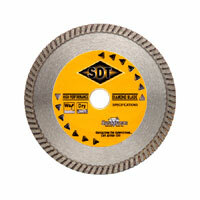 These blades are excellent for any portable job, including those that involve dry cutting operations. 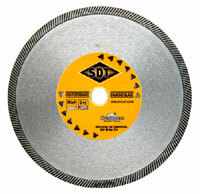 The CD Series Diamond Pattern Rim Blades are intended for a single purpose: natural stone cutting. Sharing the same benefit of enhanced air cooling as standard turbo rim blades, the diamond pattern rim also provides one additional service—the ability to deliver smooth, chip-free cutting due to the symmetric rim surface, which results in significantly lower vibrations for profiling-like cuts. The TB-R Series Wide Turbo Rim Blades consists of a medium bonding matrix for optimal performance on natural stone, brick and other hard materials. These blades utilize wide turbo sections along the rim to increase cutting speeds for larger yields.